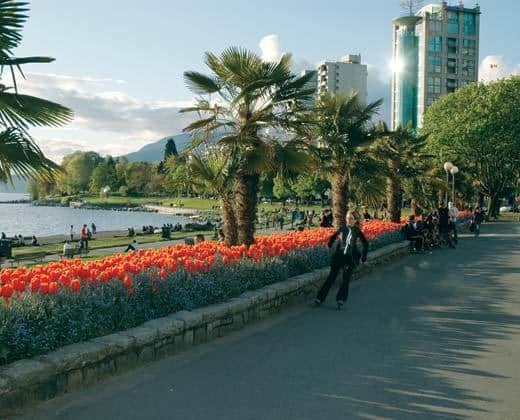 There is more to do in Vancouver than watch the Olympics. Here is a short list of some of the world class entertainment that is waiting for you this month and next in what has been called the most livable city in North America. A once only musical tribute to Neil Young. Created by Hall Willner with a star-studded cast. Tonight at Queen Elizabeth Theatre (tickets required). The cast of Slovakia’s Teatro Tatro turn a cartoonish bus into a mobile sketch-comedy stage, taking suggestions from the audience and turning them into a hilarious show. Through February 27 at various locations around town (free). Montreal’s ever popular Cirque Éloize will stage Rain, which combines theatrics with acrobatics. March 18, 19, and 20 at the Centre for the Performing Arts Vectorial Elevation (free). The skies over Vancouver are being illuminated by 20 robotic searchlights, changing every eight seconds. Nightly through February 28 over English Bay, visible from vantage points throughout the city (free). An musical introduction to aboriginal culture based on a traditional Tlingit tale. February 20 through 25 at various locations around town (free). An installation of fantastical figures created from crinckled paper by artist Ed Pien. Through April 11 at the Museum of Vancouver (tickets required). An evening of outdoor theatre with a stunning set and an apocalyptic storyline. Through February 23 at the Lost Lake in Whistler (tickets required). Bruce Walther and Liz Calvin are putting the finished touches on the beautiful nine by nine foot mosaics that adorn the sidewalks of several neighborhoods downtown. Through February 28 in Sleep Country Canada (free).